Recently, the coast near Yamba, Australia experienced a bizarre natural phenomenon. 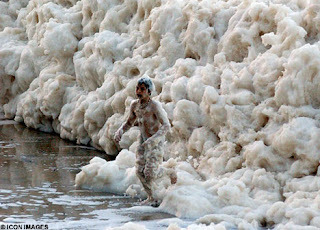 With little warning, a band of froth, which stretched for 30 miles out into the ocean suddenly started to wash ashore, leaving bathers to wade through what looked like the world's largest pile of whipped cream. This rare occurrence is said to take place when impurities such as salt, dead plants, rotten fish, and seaweed excretions (yum!) are churned together by waves, storms and currents until they reach the consistency of a milkshake. Sounds interesting, but even though it looks like fun, I don't think I'd play in it! See more incredible pictures here. That would be cool and yucky! Yeah definitley, um, ..... "yucky"